You ask a lot from your feet every day. 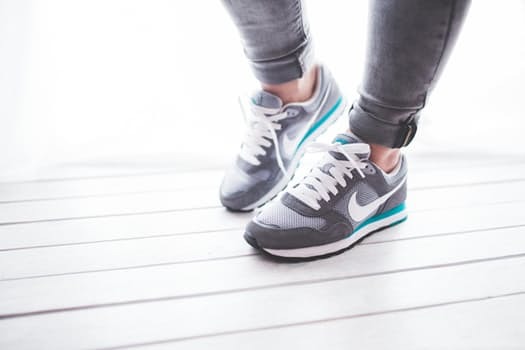 They are arguably the most abused part of the body as they must support our weight and move us from place to place while walking, running, or jogging. Some people never find time to pamper their feet with skin treatments or foot massages due to a busy schedule. However, a few minutes a day is all it takes to feel lighter and move easier. These suggestions are easily done while at the office or relaxing on the couch. Elevate your heels through the balls of your feet. Stay in this position for 10 seconds then relax. Rise again and hold for another 10 seconds. 10 reps of this cycle will increase your calf muscles and help reduce cramping and fatigue. Help your toes relax by placing a golf or tennis ball beneath your foot. Now make it roll using the bottom of your foot. Apply different amounts of pressure to relieve tensions in different areas. This exercise is great for reducing inflammation and increasing circulation. This exercise can be completed by raising one foot then point it downwards as if trying to touch the floor and then relax and bring it back to the normal position. Hold this exercise for 32 seconds to stretch smaller muscles that are located at the base of your feet. This exercise will help boost blood circulation and reduce pressure and foot pain. Place toe separators or cotton balls between each toe. Then squeeze your toes while gently massaging your foot. Hold the squeeze for 10 seconds then release. Repeat 10 times. This exercise offers the best workout for the ligaments that support your toes and helps reduce deformities. Soaking your feet in lukewarm water helps increase circulation and sooth the skin. Try adding sea or Epsom salt to increase the bath’s comfort. Be sure to test the water with your hand to make sure the temperature is appropriate for a safe soak. To schedule an appointment contact our office at 843-449-FOOT(3668).